Skye, Caisteal Uisdean, interior. View of window in East wall. Skye, Caisteal Uisdean. General view of exterior. Skye, Caisteal Uisdean, interior. General view. Skye, Caisteal Uisdean, interior. 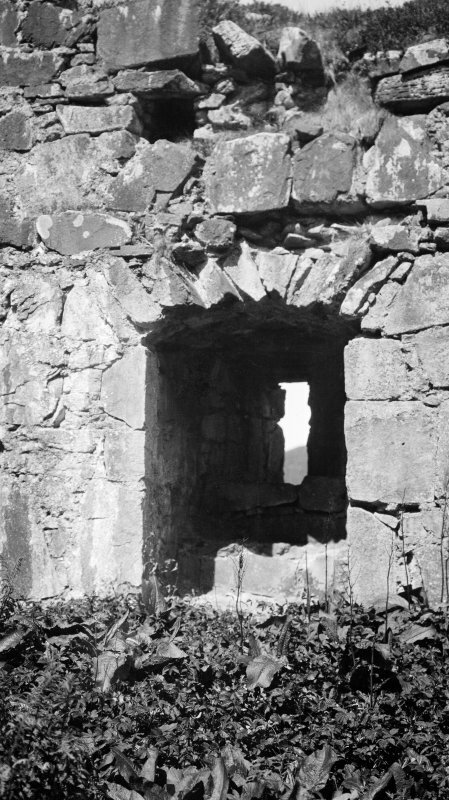 Detail of recess and slit in South wall. Skye, Caisteal Uisdean. Detail of North corner of West wall. 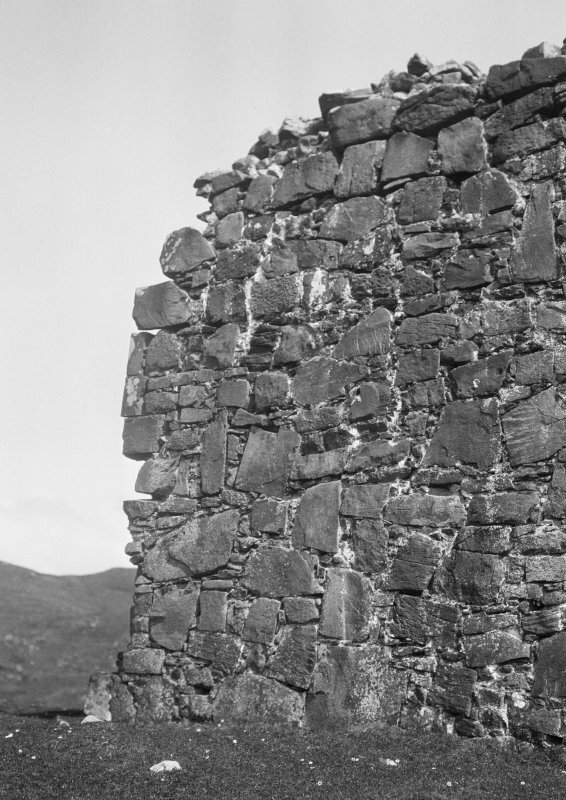 Caisteal Uisdean (Hugh's Castle), probably early 17th century Sharp-edged, whinstone stump of an unvaulted tower overlooking the entrance to Loch Snizort Beag. The ground floor (basement) walls are devoid of openings, except narrow loopholes in deep embrasures. Signs of a first floor entrance can be seen on the west wall, with part of a steep mural stair ascending to an upper chamber on one side. 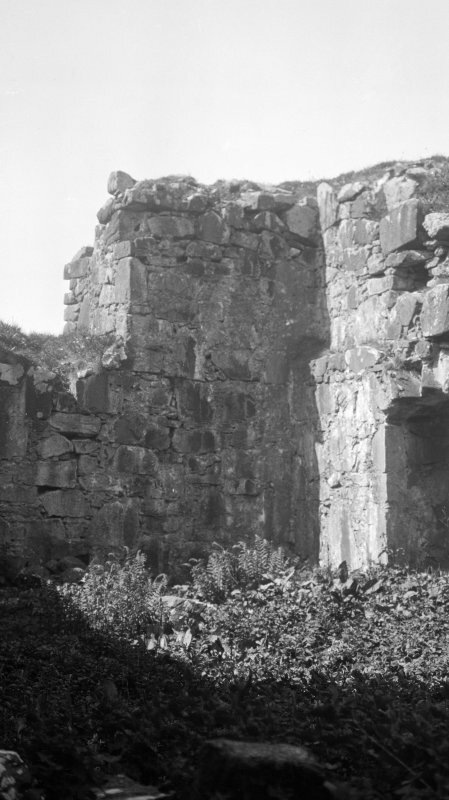 Evidence of windows on three walls, and a fireplace in the north wall. Caisteal Uisdein - similar in type to Castle Maol (NG72NE 1), quadrangular on plan measuring externally 49ft 8ins x 32ft 9ins and orientated E-W. The walls vary from 7-9ft thick and are of randon rubble. There are no mouldings or string courses, the basaltic material being unsuitable. A scarcement of 9ins on the side walls to carry the first floor beams shows that the ceiling was not vaulted. 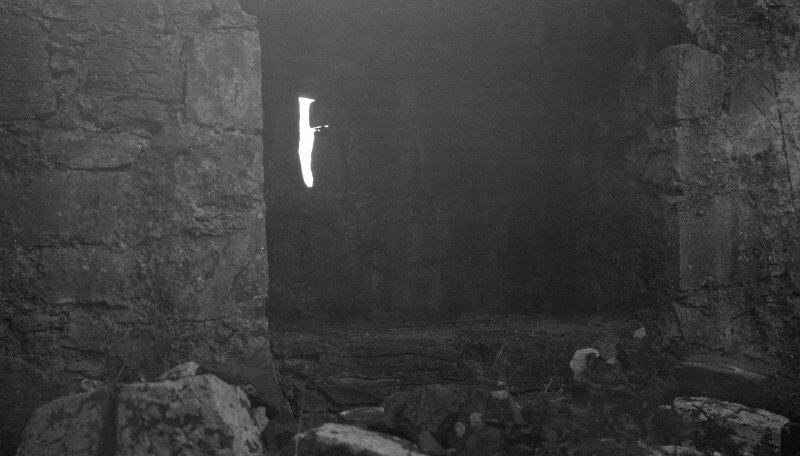 The basement is lit by two small loops only; there are no other openings. The doorway is in the first floor, 9ft above ground level. 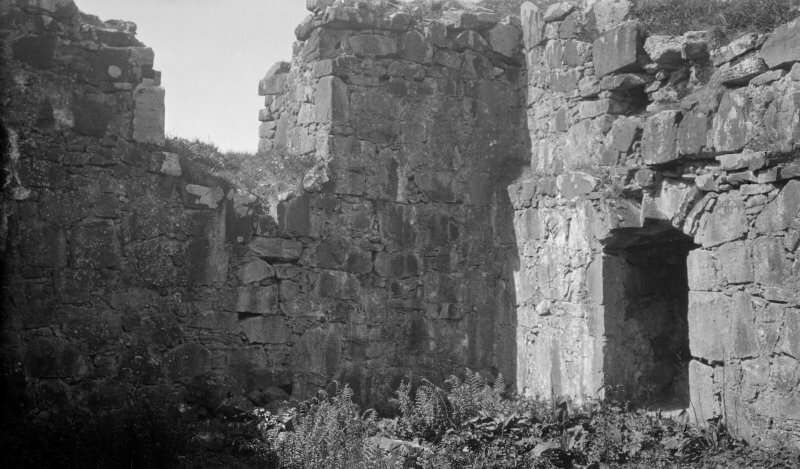 Four other indefinite openings in the walls, two in the S wall, and one each in the N and W walls are probably windows. 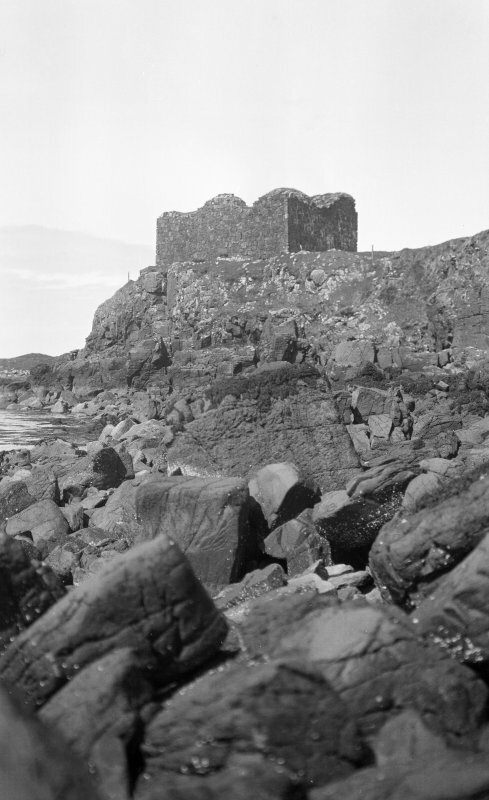 The tower is reputed to have been built by "Uistean Mac Ghilleaspuig Chlerich' about 1580 (RCAHMS 1928). The spelling of the name on OS 6"map, (1904) is a typographical error (Name Book 1877). Name Book 1877; RCAHMS 1928. Caisteal Uisdein; a 16th century tower as described above. Roofless but in good condition. the eastmost window in the south wall pierces the wall to the outside. 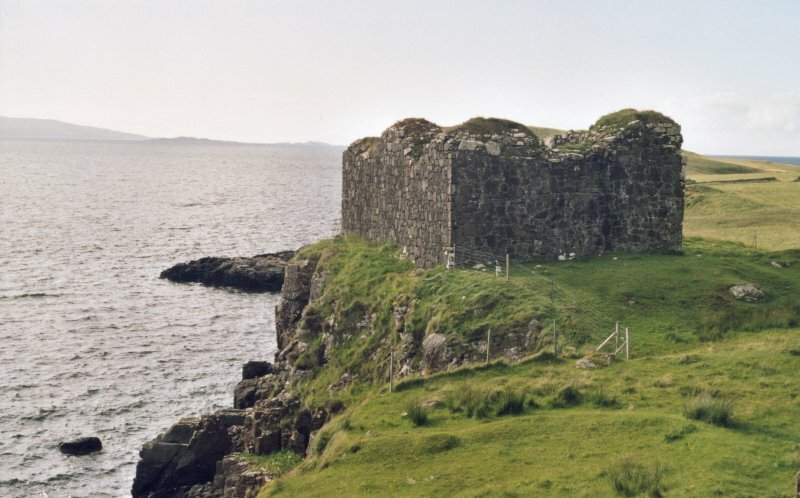 HISTORICAL NOTE.-The story of " Hugh's Castle" is t o the effect that it was built about 1580 by " Uistean Mac Ghilleaspuig Chlerich (Hug-h . the son of Archibald the Clerk), who was a very powerful and treacherous man," as a factor in an intrigue against his uncle Donald Gorm Mor of Sleat. " This tower . . . was never entirely finished. It was erected on a rock by the seaside and had neither doors nor windows, but was t o be entered on the top, by means of ladders, which could be pulled up and let down at pleasure." Hugh was seized 'and left to die of thirst in the prison of Duntulm. I The description is erroneous, but no retailer of the traditionary account, down to our own day, has ever thought of checking it. As detailed above, the place has both windows and a door, but it may be the case that it was never completed. I New Stat . Acct., xiv ., pp. 258-60 and 289-90.